Liam Beckett remains convinced he will never see a better rider than Robert Dunlop at the North West 200. Beckett, who was Dunlop’s mentor and mechanic during a success-laden and formidable partnership for much of his career, is adamant his fellow Ballymoney man would have set an unbeatable record of victories at the event had it not been for his 1994 crash at the Isle of Man TT. Liam Beckett and Robert Dunlop were a formidable team. 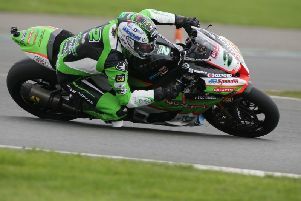 Robert sustained crippling injuries that confined him to the smallest 125cc machines but he still managed to achieve 15 wins in all, a record that was only overtaken in 2016 by Alastair Seeley. Beckett, who is now a sports pundit for BBC Sport NI, says that although he is biased, Robert’s track record proves that he would have gone on to win many more times at the North West 200. “I cast my mind back to all the good times at the North West and it was such a blow to be so cruelly deprived of the best rider certainly that I ever watched at the North West. “I make no apology for saying that and his record during his era stands up to all scrutiny. “Had Robert not been so badly hurt in his crash at the TT in 1994, I believe he would have gone on to set a record at the North West that would never have been beaten. “Robert was winning at a time when the quality at the event was phenomenal; when you had the likes of Phillip McCallen, Joey, Brian Reid, Eddie Laycock, Carl Fogarty, Steve Hislop – so many top class riders. To win 15 times and then for the latter part of his career to be confined just to the 125 class, it speaks volumes for the talent that Robert had,” he added. “There will never be another around the North West 200 and I mean that with all due respect to Alastair Seeley or anyone else. “Am I biased? Of course I am and he was my favourite rider, but set that aside for a moment and look at the facts: the facts back up what I’m saying. Beckett, who received the MBE for services to the voluntary sector and sport this year, said memories of Robert’s fatal accident ten years ago remain very raw. “It’s very fresh and it is still very raw and I struggle with it to this day to be honest, perhaps more than ever. But I also feel most for Robert’s family because I know they miss him more than anyone.